If you could only take five inventions back in time to the Roman empire, what would you take that would be most useful in building a modern society? I once thought the best five technologies would be electricity, the internal combustion engine, and other hardware. But over the years of asking this question of my economics students, their insightful responses made me rethink what is truly valuable. Software, or in other words, the intangible rules of a sovereign economy. There can be little argument that one of the greatest and unceasing “institutional” technologies is the idea of a corporation. It allows multiple owners to share the control and/or profits of an productive organization. More importantly, it limits their individual liability. Thus the notion of the “limited liability” company would be the first technology on my list — it enhances innovative activity and risk-taking, while still punishing companies themselves for defective and dangerous activity. Maxfield & Oberton resolved to take to the public square.On July 27, just two days after the commission filed suit, the company launched a publicity campaign to rally customers and spotlight the commission’s nanny-state excesses. “It was a very successful campaign,” says Mr. Zucker, “just not successful enough to keep us in business.” On Dec. 27, 2012, the company filed a certificate of cancellation with the State of Delaware, where Maxfield & Oberton was incorporated, and the company was dissolved. But in February the Buckyballs saga took a chilling turn: The commission filed a motion requesting that Mr. Zucker be held personally liable for the costs of the recall, which it estimated at $57 million, if the product was ultimately determined to be defective. The glassmaker then studies the fractures, which reveal the glass’s secrets. Glass fails, Bradley wrote; the researchers then learn from the failure, and the cycle repeats. And improves. Glassmakers know that from failure comes strength. And there is no failure without risk. There is no growth — no success — either. After a 3 season hiatus, the econ blogger survey is back. I have sent out notification to the 170 or so top economics bloggers that I know, but if any new hotshot bloggers on the scene would like to participate, please contact me. You can reach me through the hudson.org website. I just received a preview of the book WHERE THE JOBS ARE by John Dearie and Courtney Geduldig, and it is fantastic. I don’t know how to put this without sounding arrogant, but I don’t think many mainstream nonfiction books are able to combine educational & entertaining material at a high level — usually it’s one or the other. This book does it, and its topic – jobs in America – couldn’t be more important. The writing is rich, the topics are well organized, and the message is strong. I am sincerely excited to dig into the details of the later chapters. Oh, and by the way, the text is studiously non-partisan. Highly Recommended. How close is the U.S. to amending the Constitution. Well, there have been 27 amendments so far, 17 since the Bill of Rights (the first ten amendments, for those not keeping score), or roughly one amendment every 12 years or so. I wager the odds are high that we will see a 28th amendment in my lifetime … which hopefully is longer than 12 more years! And if we are lucky, there will be more than one. I do believe that keeping the Constitution alive — through amendments not interpretation — is vital for preserving liberty and keeping up with changing times. Deficits create a fiscal illusion that the cost of government is less expensive than it is. Once politicians learned that voters were tolerant of deficits of millions of dollars, they responded with deficits of billions of dollars, and now a trillion-dollar deficit. Let’s admit it, then. Conservatives were wrong not in beliefs that higher marginal tax rates harm growth and jobs and that debt is dangerous. We were wrong about strategy. The beast was not starved. The challenge is to restore budget discipline. Sounding the alarm is not good enough. If we are to restore economic sobriety and intergenerational fairness to the budget, a binding solution is needed. Bizarrely, few of the many responses have been willing to address our central argument that an amendment may be necessary, preferring ad hominem instead. Even Dan Drezner, to my surprise, came a little unhinged, though he wins the award for the most light-hearted response. Is anyone who worries about a 3:2 ratio of spending to revenue a “Debtist”? Mock me, fine, but at least give me a more nefarious moniker, Dan! 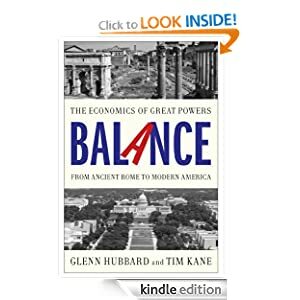 Anyway, I had the pleasure of speaking in Chicago at a half-day conference over the weekend on the balanced budget amendment, hosted by bba4usa.org. Their website is a good resource, and I am grateful that the organizers are open to the approach Glenn and I took when drafting our proposed amendment text (the appendix in BALANCE). What was news to me is that some fringe right-wing groups are dead-set against the BBA, and in particular against a convention of states (known as an Article 5 convention, so named because the process is described in Article 5 of the Constitution). The supposed concern is that a convention of states discussing a(some) fiscal amendment(s) might take the occasion to do a “Delegates Gone Wild!” video, banning guns, banning free speech, promoting God Knows What, and probably adding a particular clause banning any member of the Scalia family from serving on the Supreme Court. A runaway convention creates Lefty Utopia! Set aside for a moment how difficult (impossible) it will be for those runaway proposals to get approval from 3/4 of the states: Is there any possibility of delegates going beyond the scope of their authority? Sure, there is a possibility, if only because some degree of flexibility is necessary or else there’s no sense in convening. But where does my flexibility end and your wildness begin? On that note, every time schools let children play in the playground, there is a possibility that they will come to harm from an unlikely accident. This kind of paternalism is a Lefty fetish — no tag, no merry-go-rounds, no tall swings, no monkey bars, no running, indeed no playing on the playground. How dare we exercise the liberty afforded by the Constitution to convene and discuss, you know, liberty. Those who favor an amendment need to accept that balancing the budget of the United States is a centrist idea — we should not want and indeed should welcome fringe opposition,which will surely be hyperventilating on the Right and Left. Maybe the time has come for a good fight between the Balanced Centrists and the Unbalanced Debt-Deniers. In all seriousness, voters should balance the costs and benefits of both action AND inaction. Do those opposed to a convention of states think that the current path is 100% safe for their cherished rights? How’s that free speech holding up? Is federalism as robust as it was 100 years ago? I’d like to think that a convention would not only restore some of the protections of liberty, but also could be done in a way that heals the divisive politics of the past generation. Or perhaps you believe that politics as usual is the safest course for America’s future! Finally, I’m delighted to have Mark Levin as an ally in the cause for amending the Constitution. 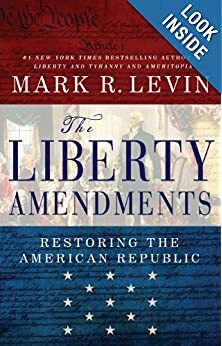 Levin just published a new book called “The Liberty Amendments” and I ordered a copy from Amazon today. You should, too. Levin is a lot smarter and wiser than critics will admit. Sure, he rants on the radio, which sometimes makes me laugh and sometimes makes me turn the dial, but it would be a mistake to discount his substance just because you’ve heard that his style is abrasive. Let’s give this book a fair reading and talk about it.